SEOUL, South Korea, May 15, 2018 /PRNewswire/ -- Kokam Co., Ltd, the world's premier provider of innovative battery solutions, today announced that it has successfully deployed for Alinta Energy, a leading Australian utility, a 30-megawatt (MW) system / 11.4-megawatt hour (MWh) Energy Storage System (ESS), the largest lithium ion battery deployed for industrial application in Australia. 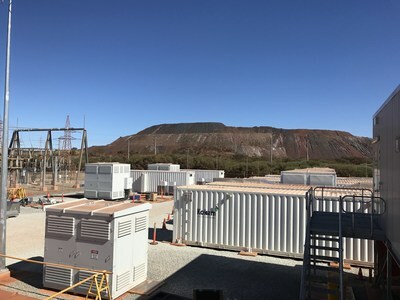 The ESS features Kokam's high power Lithium Nickel Manganese Cobalt (NMC) Oxide battery technology, and is being used to improve the performance of an islanded high voltage network, which supplies power to major iron ore producers in the Pilbara region of Western Australia. Operational since April 2018, the ESS consists of five 2.2 MWh Kokam Containerized ESS (KCE) units using Kokam Ultra High Power Lithium-ion NMC (UHP NMC) batteries. The ESS, in conjunction with Alinta Energy's existing 178 MW open cycle gas turbine Newman Power Station, serves as a hybrid natural gas/battery energy generation and storage system. This hybrid system, along with a 220 kV high voltage power transmission system and high voltage substations, form an islanded microgrid that is used to power iron ore mines. In addition to delivering Alinta Energy the ESS used for the project, Kokam, in partnership with EPC contractor UGL Pty Ltd, also served as the system integrator on the energy storage project. Kokam contracted ABB Australia to supply the ABB PowerStore™ "Virtual Generator" used to manage the microgrid. Adding the ESS to the microgrid will improve Alinta Energy's ability to reliably deliver energy to the region's iron ore producers. "For the iron ore industry in the Pilbara, generating hundreds of thousands, if not millions of dollars' worth of output an hour, a reliable energy supply is crucial. This battery will let us better handle peak demand periods, increase reliability for our customers and lower our emissions as a result," said Alinta Energy, MD & CEO, Jeff Dimery. "The project demonstrates our commitment to finding innovative ways to integrate our existing thermal generation portfolio into an evolving market that will incorporate more renewable generation and other disruptive technologies, with an emphasis on sustainability, reliability and affordability of supply." "Alinta Energy's hybrid natural gas/energy storage system and islanded microgrid demonstrate how innovative technologies, combined with intelligent design, can improve power reliability for industrial customers, while also providing efficiency and sustainability benefits," said Ike Hong, vice president of Kokam's Power Solutions Division. "The Alinta Energy Newman Battery Storage Project provides an example of how new high power energy storage technologies enable both utility and industrial customers to build hybrid natural gas/battery systems that increase energy reliability, lower greenhouse gas emissions, and boost their bottom lines." The Alinta Energy project provides an example of the growing number of utility and industrial market opportunities for Kokam's UHP NMC battery technology. Designed for high-power energy storage applications, the UHP NMC battery technology can be used by utilities and other energy services companies for spinning reserve, frequency regulation, wind or large solar power system ramp rate control, Uninterrupted Power Supply (UPS), voltage support and other applications that require large amounts of power be dispatched in seconds or less. In addition, the technology's ability to quickly receive and dispatch very large amounts of power make it particularly well suited to be combined with natural gas, diesel and other power systems used to generate energy for industrial applications, where even a brief power disruption that shuts down mining, off-shore drilling or other industrial operations can result in costs totaling hundreds of thousands or even millions of dollars. High discharge rate: UHP NMC battery technology has a max discharge rate of 10C, compared 3C for competitors. This enables UHPNMC batteries to dispatch more power when needed. High energy density: The UHP NMC battery technology's high energy density enables up to 3.77 MWh of energy storage to be installed in a 40 foot container, compared to 3 MWh of energy storage for standard NMC batteries, allowing more energy to be stored in a smaller space. Long cycle life: UHP NMC batteries can last up to 10,000 cycles, compared to 3,000 - 5,000 cycles for standard NMC technologies, increasing the energy storage system's expected life. Improved heat dissipation: With a heat dissipation rate that is 1.6 times better than standard NMC technologies, UHP NMC batteries can be used at a higher rate for longer periods of time with no degradation in battery life or performance. Alinta Energy is a leading and fast-growing Australian utility with an owned and contracted generation portfolio of around 2,000MW, over 800,000 combined electricity and gas retail customers and over 500 employees across Australia and New Zealand. We have been supplying energy to customers in Australia for over 20 years.